- Area of Fabrics which is to be cut 100 cm ². RUBBER PAD: FOR THIS APPLICATION FOR REPETITIVE TEST WITHOUT FAIL. - Frame is made of very strong composite material. 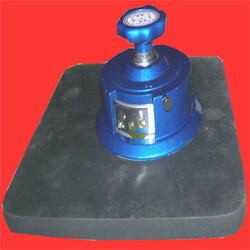 punching size : 25mm, 36mm, 32mm, 54mm, 58mm, 56mm, 75mm, 115mm. - To find out the GSM of woven/knitted fabrics along with 4 Nos. Imported blades and two numbers rubber pads to give a cut piece of 1/100th part of a square mtr area with locking arrangement for safety. 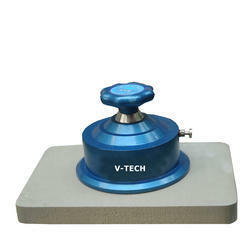 FEC GSM Kit use a drawing action to cut accurate circular samples with smooth edge. Even difficult material as card board, filter paper, Craft paper, corrugated sheet, fine knit, thin film, synthetic leather, can be cut conveniently.